Yamaha Corporation has recently been named again a Top 100 Global Innovator for 2016 by Clarivate Analytics. This recognition was based on the high appraisal of its intellectual property activities in Japan and overseas. As in 2015, Yamaha continued to be highly appraised for the global nature of its activities. Yamaha was first selected for this award in 2011, then in 2014 and 2015 and for the third consecutive year in 2016. Yamaha is continuing to develop and acquire patents and other intellectual property as it also remains committed to respecting the intellectual assets of others. Companies and institutions this year were selected for the Top 100 Global Innovators by Clarivate Analytics, formerly the Intellectual Property & Science business of Thomson Reuters, which is a global information services company. The innovators selected for recognition are chosen from among the most innovative organizations around the world, and 2016 was the sixth year for this list to be prepared. Clarivate, based on its patent database, analyzes trends in intellectual property and patents, and evaluates companies based on four main criteria, namely, "volume," "success," "globalization," and "influence." Clarivate then selects the innovators that secure protection for their intellectual property that embodies original ideas for inventions, and, by successfully commercializing these, become leading global organizations. 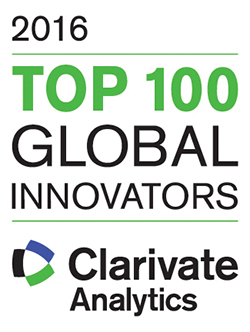 We wish to express our deep thanks to Clarivate Analytics for selecting Yamaha as a "Top 100 Global Innovator" for the third consecutive year. We understand that the selection of Yamaha for the list was your high evaluation of our patent activities which are based on the close collaboration between our R&D and our business operations. Also, as in the previous year, we are very pleased that Yamaha was highly evaluated for the "securing of global patents." This is a result of our policy to "build a global patent portfolio." Looking ahead, we will continue to protect and further develop our globalizing business through our intellectual property activities.